Broughton successfully took on last year’s champions, Stapylton, in the grand final of QIQE to claim the crown in this year’s inter-House quiz. 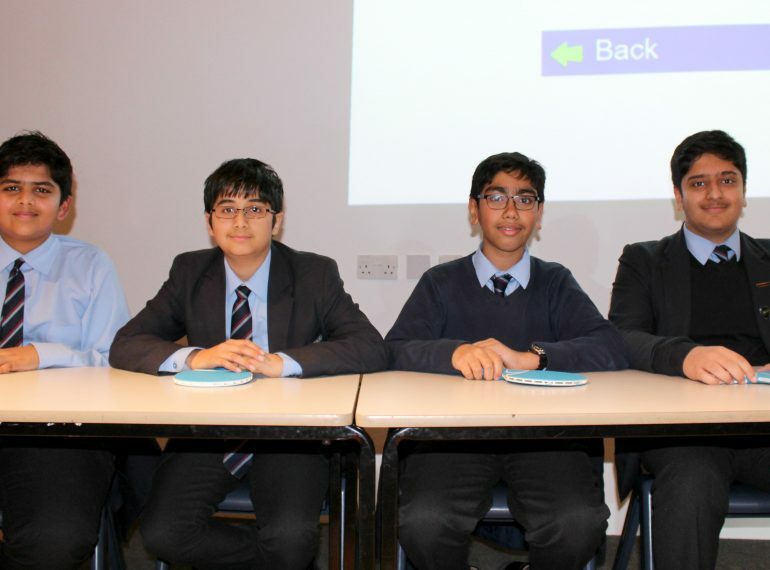 The fiercely fought battle in front of the whole of Years 7–10 saw Broughton win with a total of 180 points, ahead of Stapylton’s 100, notwithstanding the presence in the Stapylton team of Year 9 boy Rahul Doshi, who was Channel 4’s Child Genius in 2017. 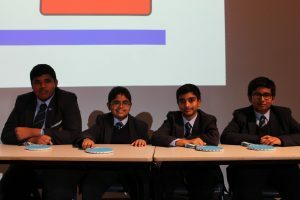 Both Houses had secured their places in the final after topping their respective group rounds in the earlier stages of the competition, which is modelled on the BBC’s University Challenge. Organiser James Clarke (OE), who is an Extra-curricular Enrichment Tutor, said: “In recent years, QIQE has established itself as a key fixture within our eclectic programme of events that make up the overall House Competition. Biology teacher Hinesh Shah (OE) acted as quiz master for the final in the Shearly Hall, which followed the familiar format of a starter-for-ten, followed by three bonus questions worth 5 points each, with 5 points lost for those who ‘buzzed’ (or, in fact, raised their paddle) before the question was finished and then got the answer wrong. The final lasted 20 minutes. Each team comprised one boy from each of years 7, 8, 9 and 10. Boys are restricted to only competing in the quiz once, so, for example, last year’s competitors were ineligible. While Stapylton were strong on buildings & architecture, car manufacturers, food and capital cities, the Broughton boys’ impressive knowledge of astronomy & astrophysics, television characters, authors, football grounds and film scores helped see them to victory. The Broughton finalists were: Sultan Khokhar (Year 10); Ishaan Mehta (Year 9), Aradhya Singh (Year 8) and Kaushik Reddy Nakki Reddy (Year 7). Stapylton’s team were: Aarav Shah (Year 10); Rahul Doshi (Year 9); Madhav Menon (Year 8) and Koustuv Bhowmick (Year 7). How would you have fared? Here are six sample questions. Answers at the bottom. 1. Puck, Bottom and Titania are all characters in which Shakespeare play? 3. How many colours are there in the spectrum when white light is separated? 4. Which recently deceased comic book writer has had a cameo in the majority of Marvel films? 5. The Allianz Arena football ground is home to which European club? 6. What is the jellylike material that makes up much of a cell inside the cell membrane?